When it comes to pricing, there are a lot of factors to consider with the actual grade of the card having the most influence. In the next few paragraphs, I would like to touch on a few subjects to assist the readers on how to use this guide. Hopefully, this section will help answer some frequently asked questions. This might be the hardest area to price considering the volatile nature of low-population commons and the incredible response to the PSA Set Registry. More and more collectors are trying to build PSA-graded sets, so the demand has surged immensely in recent times. Keep in mind that the prices you see in this guide are for commons with average population numbers. In other words, the prices are not for scarce commons. Scarce commons (not listed individually in SMR) will usually sell for a premium, sometimes a significant one, above the listed prices in SMR. Please keep this in mind - you may have to pay multiple times SMR price for an extremely rare "common" card. Realize that this market can be a volatile one. What is considered scarce today may not be tomorrow, so you need to look at the PSA Population Report in context. Is the card scarce because it is truly scarce like a high-grade T205 common, or does the card have a low population number merely due to the fact that few people have submitted the card for grading. This is very important. Talk to experienced collectors and dealers for guidance; they may be able to provide excellent insight. 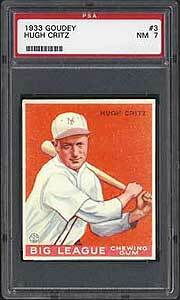 Price premiums may apply to those cards that exhibit high-end characteristics for the grade. For example, there are PSA-graded NM-MT 8s that may have just missed reaching Mint 9 status and others that just missed the Near Mint 7 grade. There are strengths within each grade; it's entirely logical and expected. The prices you see in SMR are for those cards that exhibit average qualities for the particular grade. In other words, if you happen to run across a very high-end 1956 Topps Mickey Mantle in PSA NM-MT 8, the seller may be asking a premium based on the quality. Depending on the strength of the card and the scarcity within that particular grade, a small or major premium may be added to the price. For the most part, premiums should be reasonable and not too drastic. With the advent of half-point grading, which has made the grading scale more precise, these types of price premiums should be more reasonable; however, there are still strength variances within each grade. Price premiums may apply to cards that feature players, even common players, from popular teams and/or cities. The most obvious example of this phenomenon would be the price premiums associated with New York Yankee or Brooklyn Dodger players. Due to the overwhelming popularity of these teams, players who would otherwise be deemed as "common" are elevated to an almost semi-star status. The teams have so many fans and such a loyal following that an average player on the Yankees is more nationally recognized than a star for the Minnesota Twins. You may have to pay more for these types of cards, especially where the particular year was considered special for that franchise. For example, the 1955 Brooklyn Dodgers have an extraordinary following. In cases where a card has not yet been graded or in cases where a card is extremely scarce and rarely comes up for sale, we do our best to give conservative estimates for those cards. We try to compare that card to other comparable rarities in order to come up with a price, but our stance at SMR is that a card is worth what someone is willing to pay so we try to avoid speculating too much and focus on actual sales. If you know of a rarity that has sold privately and it can be verified, let us know. We can't make changes if we don't have the pertinent information. One price realized, whether the swing is up or down, will usually not cause a change in SMR. Many times, a card at auction may surge to an astronomical price due to two bidders battling for it when the card usually sells for much less. There are many cases where the exact opposite occurs. A card may get overlooked during a sale and someone walks away with a bargain. At SMR, we try to use our experience and not let one or two sales of a card, strong or weak, dictate the SMR price. We look for patterns. 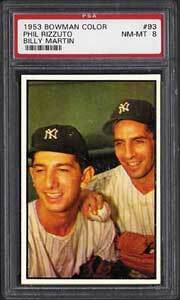 Of course, there are situations where a super-rare card may sell and we alter the price due to the rarity. For example, if the famous PSA NM-MT 8 T206 Honus Wagner sells for a certain price, we will adjust the SMR price to directly reflect that sale because we know that this PSA example is the only one in existence of that quality. When it comes to pricing, there is no general rule that can be applied to cards that exhibit qualifiers such as OC (off-center), PD (print defect) or ST (stain). It really hinges on the eyeappeal of the card and the inherent difficulty of the issue. For example, since a 1989 Upper Deck Ken Griffey Jr. rookie card is relatively easy to obtain free of qualifiers, one of these cards would drop in market value significantly if any qualifier is present. The value would drop as much as 1-2 grades, at minimum, in terms of value. In other words, a PSA Mint 9OC would probably sell between PSA NM 7 and PSA NM-MT 8 value. On the other hand, there are issues that are so difficult in high-grade that the qualifier, depending on the type and the severity, would not lower the value greatly. For example, a 1954 Wilson Franks card with an OC designation may not be severely affected since that issue is extraordinarily difficult to find nicely centered. In addition, the degree of the qualifier can also be a factor. A PSA 8OC 1933 Goudey Babe Ruth #144 that features 72/25 centering will usually carry more value than one featuring 90/10 centering. This is also true for other qualified cards, like cards exhibiting stains or print defects. Severity is the key. The more the qualifier hinders eye appeal, the more the value will suffer. Pricing can be a very difficult task, especially where the market experiences swings. At SMR, we do our very best to reflect market conditions and work hard to add more and more pricing each and every month. Accuracy is very important to us. Input from you is crucial. We scour auctions, talk to dealers and collectors every week and travel to shows looking for updates but we can never have enough input. Please, if you feel that a particular set has been overlooked or that certain cards need price adjustments, let us know. You can e-mail input directly to [email protected] for review. We appreciate your help. While there is never an exact formula that can be applied to PSA-graded cards due to the strength of a particular example within each grade, there are some basic guidelines that may be helpful in determining pricing for unlisted cards. Keep in mind that for most PSA Gem Mint 10s, mainly vintage examples, pricing models are virtually impossible to construct due to their extreme rarity and variance in desirability. PSA Gem Mint 10s have been known to sell for several or many times the PSA Mint 9 prices in some cases, and in others, only a few times more than the Mint 9 price. Please keep in mind that these guidelines may not apply to all cards and the ranges may vary, especially where the quality is very strong within the grade. The prices listed in SMR represent average dealer selling prices for PSA-certified collectibles. SMR is intended as a guide. You may have to pay more than the listed prices to buy the items you want. Conversely, you may be able to buy PSA-certified items for less than the listed prices. Prices only apply to collectibles certified by Professional Sports Authenticator (PSA) or PSA/DNA Authentication Services. Collectibles which have not been certified by PSA may not meet the standards of PSA and consequently may not bring the prices listed in SMR. 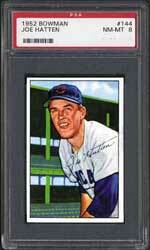 Prices should be used for unqualified PSA graded cards only. The prices that appear in Sports Market Report are for trading cards that have been graded and sold and, in some instances, for cards that have not been graded. The prices represented for trading cards not yet graded are based on comparable sportscards that have been graded and sold. For further information on PSA cards that have been graded, please visit our online Population Report. SMR is only meant to be a guide. SMR and Professional Sports Authenticator do not guarantee the accuracy of the prices listed in SMR. The collectibles market can be volatile and unpredictable; short term price swings are always possible. Professional Sports Authenticator, its principals and its representatives in no way guarantee a profit or guarantee against a loss on any trading card or collectible you buy based on information in Sports Market Report.